When it comes to managing someone with a massive fan and media following, only a few National Football League franchises have the ability to properly and successfully handle the amount of attention Tim Tebow would receive. And it is no surprise that the New England Patriots are first on that list. For anyone who believes Tebow lacks the skills needed to be on the Patriots' roster, you can take this one to the bank - Bill Belichick is not interested in marketing or public relations. He never was, and never will be. While questions would arise around the decision-making process behind another franchise signing Tebow, for reasons of marketing and so forth, these questions should not exist in New England. Under Robert Kraft and Belichick, the Patriots will always have a football-first mentality, and have a history of making controversial signings. Only franchises who are managed well from the top-down are able to make these types of moves, without disrupting the rest of the team. With nothing to lose on Tebow's contract, and everything to gain, you can be sure Belichick will manage Tebow in a different manner than that of the New York Jets. 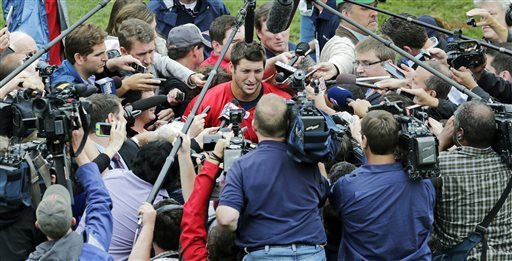 Just look at the difference between the Jets' press conference after Tebow's signing, compared to way the Patriots introduced Tebow to the media earlier this week. New England may just be the perfect place for someone in Tebow's situation. A place he knows that he is playing under management that wants him for the right reasons, something that would be up for debate nearly anywhere else.